The constant temptation of netflix, the fridge, and napping, it can not only be difficult to focus at home but also it can drive you crazy to work and live in the same space 24/7. Our advice then to make the most of ´working from home´? Switch it up! Get out the house, work remote from different locations. Websites such as Coworkers and apps such as WorkHardAnywhere (WHA) not only show the cloest coworking spaces to you but also review the spaces. Perhpas if you prefer to work in a different enevironment to your living room or bedroom its worth the extra bucks, especially if you want to have meetings or meet new people. If you travel a lot interntational ones such as WeWork could be a great option for you, they offer what they call a We Membership. With this you don’t get your own office or desk. Instead, you get access to any available desk in the common area at a variety of locations. This isn’t as convenient as a dedicated workspace, but it’s a lot cheaper. Plus, your membership still comes with unlimited free coffee (and beer). Coffee shops have become the go-to spot for remote work. Coffe shops such as the standard Starbucks, Costa Coffe… are somewhat of a safe bet. However, the problem is, everybody works from coffee shop, it can be crowded, loud, with spotty wifi, and you have to pay for, most of time, overpriced coffe. Our advice? Try out independent (probably better known as hipster) coffe shops. Cool art one the walls? Check. Plants? Check. Cool lamps? Check. They are not only perfect to post on instagram but also have superb wifi most of the time. At least you feel like you are enjoying a new, nearly social, experience, while working. So there are various options when it comes to working from a hotel ,you could use the lobby for absolutely free, the cafe / restaurant / bar / terrace at the cost of a coffe or beer, Hotel lobbies or common spaces are a great place to get serious work done away from the home office. But you might feel a bit shady hanging around a hotel without being a guest. Therefore, if you want to feel more professional you could book a microstay, a room for 3 hous or 6 hours to get some meaningful work done, make a call or hold a meeting. BYHOURS hotel microstays give more privacy and are also the perfect excuse to enjoy the comfort of a hotel and get work done at the same time. A room for 3 hours could cost as little as 20 euros or less. Additionally, many hotels now also offer business meeting rooms and business centres. You can also print, use the wifi, bluetooth and other servies from here. A good life hack is to know is that museums: art museums, history museums, science museums… are usually free, have excellent wifi and have a ´quiet area´designated for reading, studying and working. 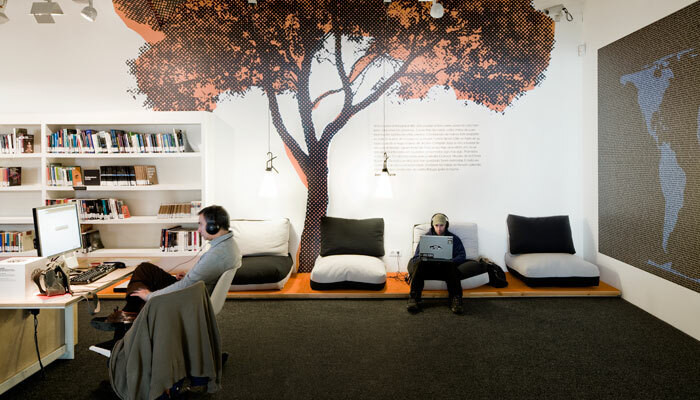 They also have cafeterias and coffe shops where you can work home, get snacks and coffe or take a break. Take a break from work with a walk around the museum, this could also be a great way to get the creative juices flowing and inspire your work. 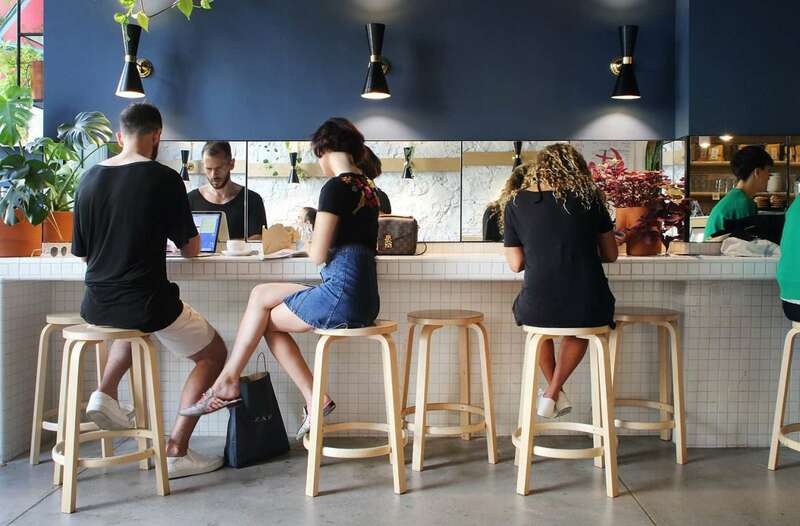 Many gyms and sports clubs now have smoothie bars, cafes, and restaurants or lounge areas with wifi can make great places to sit down with a laptop. It’s a great incentive to hit the gym more, after clearing your head and refreshing you’re in a good mental and physical space to dedicate a few hours to working. And, if travelling, a daily gym pass could be the solution and kill two birds with one stone, work out and work work in the same place. Other options could be to work outside, some parks and beaches have public wifi, but with the problem of power outlets not growing on trees and the blinding sun… it might not be the most productive choice for all. What do you think? Where are other places we should include on the list? We hoped we inspired you to step out your PJs at home and try new alternatives for working remote!